L: 32" x H: 46.5"
Arched Mirror This stylish arched mirror is a unique addition to your home. Just imagine how this dramatic mirror—inspired by cathedral windows—could bring light and life into a space. Metal mullion design is enhanced with industrial fittings that infuse so much character. Whether your decor is classic or contemporary, this mirror beautifully reflects your fine taste. 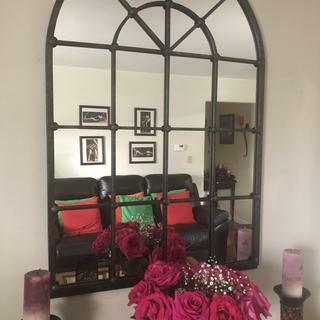 This stylish arched mirror is a unique addition to your home. Just imagine how this dramatic mirror—inspired by cathedral windows—could bring light and life into a space. Metal mullion design is enhanced with industrial fittings that infuse so much character. Whether your decor is classic or contemporary, this mirror beautifully reflects your fine taste. Mirror is beautiful and ties in perfectly with our decor. We were able to find this and it really matches a bar set and some stools that we also purchased from Raymour. 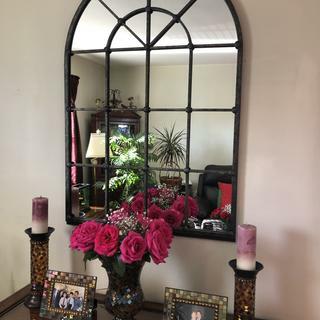 This is my favorite mirror in the house it's big and beautiful. Perfect over furniture or by itself. Looks better in person. This mirror, although too heavy in my opinion to hang on a wall, sits beautifully on the table inside my front door. I have gotten MANY compliments on the mirror! Beautiful mirror! Fills the wall nicely. Extremely heavy! The description of this mirror says it a burnished bronze, however the picture makes it look like a darker gray. Can someone tell me if this more of a bronze or gray color? BEST ANSWER: Hello Sue, thank you for your interest in the Arched Mirror! The finish is a Dark bronze-tone metal frame. Despite what the picture shows, it’s absolutely Bronze.No gray at all. It is a bronze color, beautiful mirror. Very heavy to hang!!! We purchased this mirror months ago to hang in our dining room. It is beautiful, but we are not sure how to hang it because of the weight. Any ideas? BEST ANSWER: I used two 100 LB Picture hooks. We purchased 2 heavy duty picture hangers at Lowes and nailed the hangers on the wall and hung the mirror hooks onto the picture hangers. We put it on the wall by using anchors. The anchors should be able to hold the wight of this mirror. My husband made some kind of bracket st work and bolted it to the 2x4s.